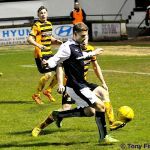 Raith Rovers failed to extend their lead in the play-off positions, as they went down by a single goal at home to Alloa Athletic. 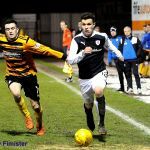 There was just one change for Raith after Saturday’s ejection from the Scottish Cup at the hands of Hibernian, with new loan signing, Louis Longridge going straight into the starting line up in place of Jon Daly. 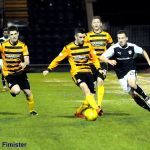 For Alloa, recalled forward, Isaac Layne was restored to the starting XI after a successful stint on loan at Ray McKinnon’s former club, Brechin City. 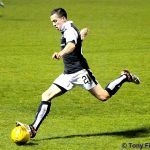 Also in Jack Ross’ team was Michael Duffy, who signed a short-term deal with the club after intimating he was leaving the Indodrill Stadium over the weekend. The familiar faces of Dougie Hill and Andrew McNeil were also in the Wasps first eleven. 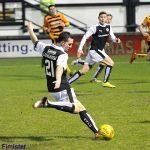 There was little action to warm up the fans in the opening moments, although a magnificent raking pass from Ross Callachan to the left-wing found a galloping Rory McKeown, but his cross was crowded out in a congested penalty area. 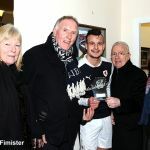 It didn’t take too long for the Raith supporters in attendance to get their first look at Longridge, when a clever backheel from James Craigen released the Hamilton man down the right-hand-side. 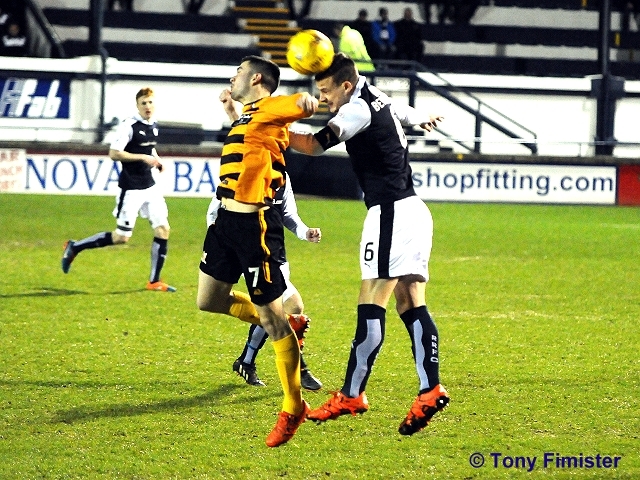 However, although the forward did well to hit the bye-line, his cross was meat-and-drink to the Alloa rear-guard. 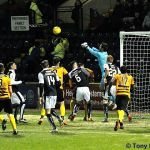 Iain Flannigan had started reasonably brightly for Alloa on their left-hand-side, but he was extremely fortunate to stay out of the referee’s little-black-book, after a very late challenge on David Bates, that saw Raith boss Ray McKinnon, and most of a Raith persuasion venting their respective spleens. That was after ten minutes, and a moment later, Rovers missed a glorious opportunity to move into the lead. Callachan’s defence-splitting pass released Longridge down the right, and his perfect cross found Megginson at the back post, but from a couple of yards out, his header somehow failed to even find the target. 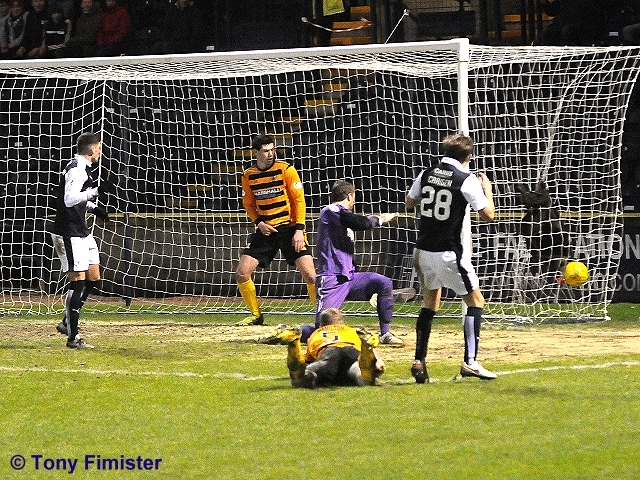 Craigen then had the game’s first dig on goal, with his 20-yard attempt forcing a reasonably comfortable save from Andy McNeil. 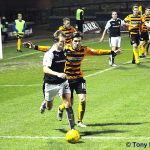 Alloa weren’t entirely on the back foot by any means however, and were looking bright down both wings, while Layne was proving to be a pest to the Rovers central pairing of Iain Davidson and Kyle Benedictus. 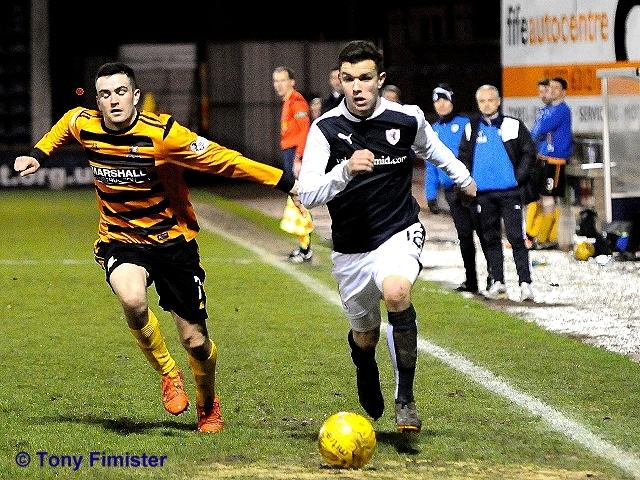 So too to Scott Robertson, who was booked for a foul on the striker 25-yards from Raith’s goal, although the set-piece was fisted away by Kevin Cuthbert. 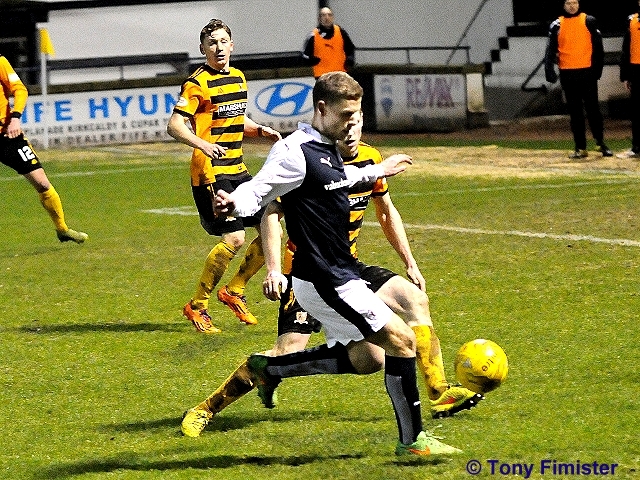 Raith were looking the brighter and more inventive however, with Craigen and Megginson in particular looking to get forward and supplement Longridge, while David Bates, in a right-back position that he’s clearly starting to revel in, was getting forward to good effect. However, despite winning a couple of corners from foraging ventures forward, they failed to produce a clear-cut opening. The longer the half wore on however, the less likely a goal looked, with neither side showing much in the way of nous or incisiveness, possibly summed up in the closing passage of the opening 45, when Longridge stumbled and fell his length while in possession in a promising position. The second period almost got off to the worst possible start. A mistake 25-yards from goal gifted possession to Layne, and after wriggling away from two challenges, his shot was deflected away by Cuthbert. Back came Raith though, who chiselled out two great openings in a matter of moments. Firstly, Craigen saw his deflected shot slither just wide after the ball was worked along the edge of the area, then, from the resulting corner, Megginson was afforded time to get the ball down and drive towards goal, but his effort was charged down. It was an encouraging start to the half, and the home side were unlucky again, when good hold up play from Callachan, eventually saw him pick out a great run from Longridge, whose cross was headed wide for a corner kick by Colin Hamilton. Again, the set-piece created a chance, but Longridge’s drive from the edge of the area was fractionally wide. 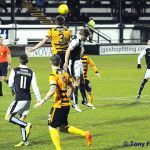 If the home fans thought it was a sign of Rovers taking control of the game, they were very much mistaken however, with Alloa inches away from taking the lead on two separate occasions in the 61st minute. First up, Michael Duffy’s shot was deflected away from goal, possibly off his own man in Layne, before the same man again popped up on the left-hand-side of the of the penalty box, only to drag his shot wide. 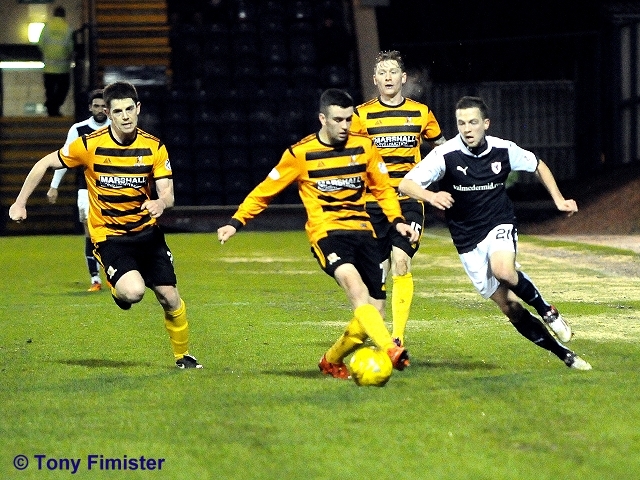 With 25 minutes remaining, Ray McKinnon made his first change, swapping Mark Stewart for Mitch Megginson, as Longridge moved over to the left-hand-side, as Stewart moved up-front. The swap almost made immediate dividends. A mistake by Doyle allowed in Stewart, whose pace took him away from the defender. He then teed up Longridge, but despite having time to shoot immediately, he attempted to beat a challenge, before eventually being crowded out, and the chance was lost. 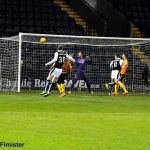 While the substitution had breathed some life into Raith’s forward thrust, they were being held in check by a disciplined Alloa defence, which no-one in the Rovers team seemed to have an answer to. 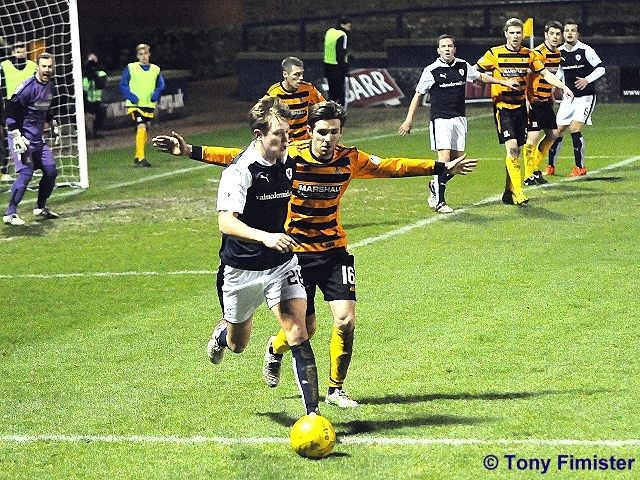 With the main tactic, hitting Stewart who was playing on the shoulder of the last defender, failing to come up trumps. With five minutes remaining and Rovers pushing forward, they were suddenly caught on the hop. A quick breakaway eventually found Flannigan inside the area, who appeared to have his feet taken away from him by Davidson’s sliding challenge. 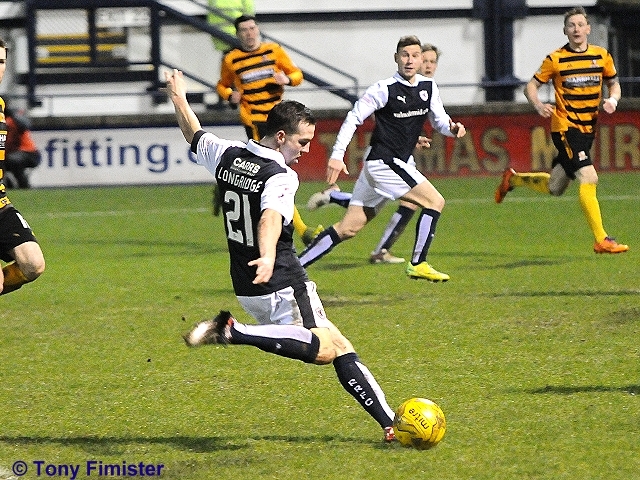 Flannigan took the kick himself, and rolled the ball to Cuthbert’s right, as the keeper elected to go left. Rovers had one last chance before the end, and it was a good one. Stewart did well to set up Craigen, but with the goal at his mercy, Colin Hamilton slid in and nicked the ball off his toe, with a match winning challenge. 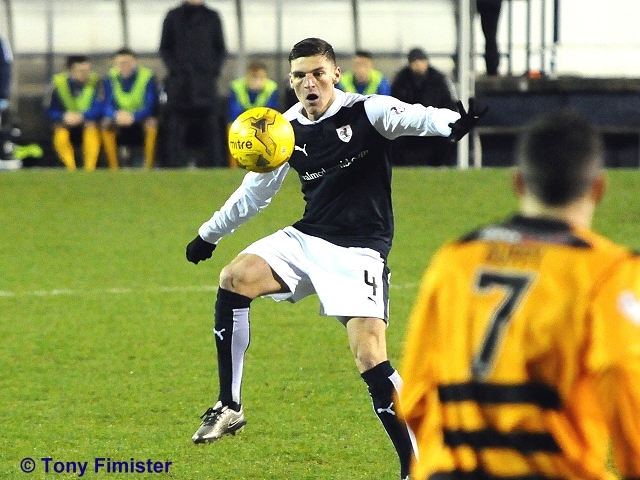 Raith remain in fourth place in the table, two points ahead of Queen of the South. Their next match is away to St. Mirren on Saturday. Benedictus charges into a sliding tackle on Doyle. Perfect timing. Craigen sends Megginson clear, but the flag's up. Tight. 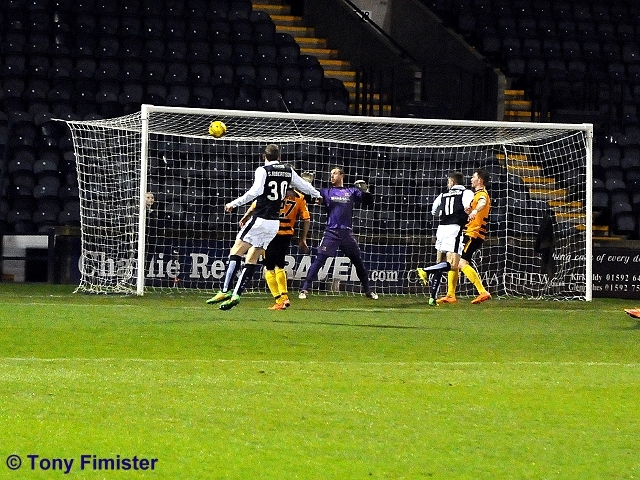 Stewart and Longridge race clear, but Longridge takes an extra touch before his shot is blocked. Craigen hits the rebound wide. 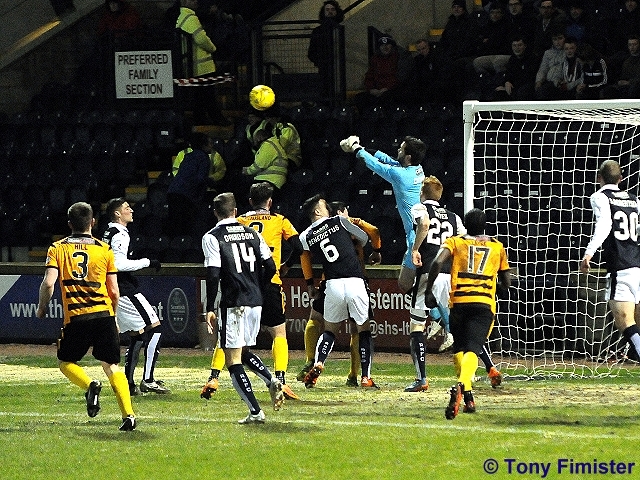 Goal Alloa. Flannigan nets the spot kick. A real sucker punch, Rovers were pressing hard. 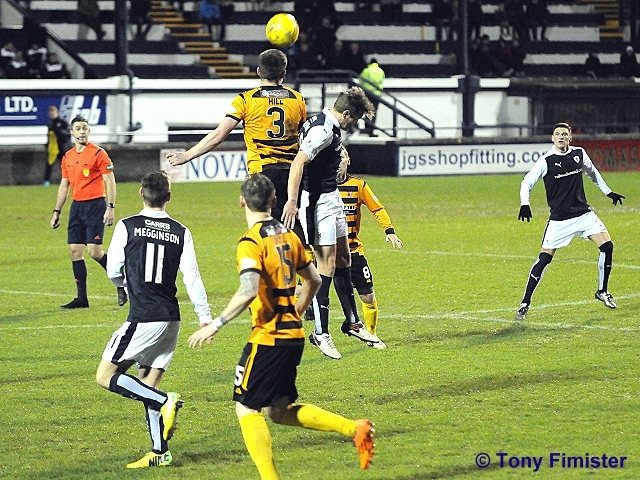 +4 No lack of effort from Raith, but a lack of precision when attacking. The new lad looked decent. 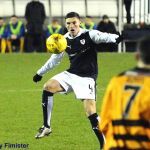 Raith Rovers have the chance to put their Scottish Cup disappointment behind them this Tuesday evening, when they get the opportunity to move five points clear of their rivals in the contest for a top-four spot in the Championship. 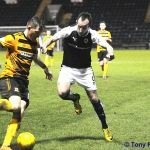 Alloa Athletic are the visitors in a fixture that was initially scheduled to be played on Boxing Day, but failed to beat the inclement weather conditions. 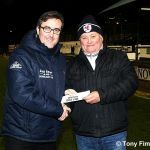 The Clackmannanshire outfit have recently had a change of management, after Danny Lennon stepped down with the club sitting at the foot of the table, allowing Jack Ross to take over the reins. 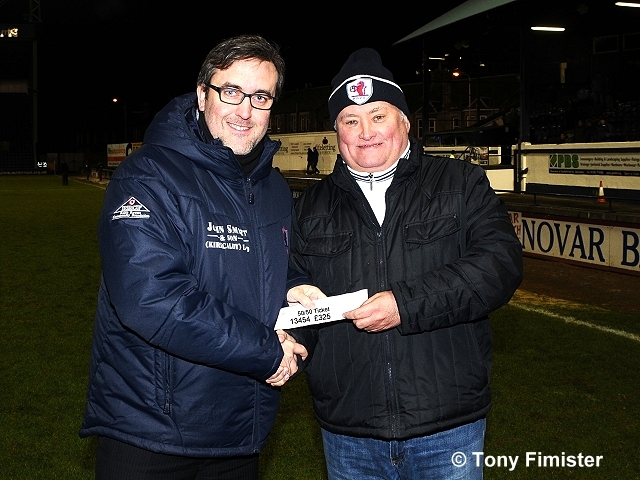 Ross had been the assistant to Ian Murray at Dumbarton, but his most recent position was as a youth coach at Heart of Midlothian. 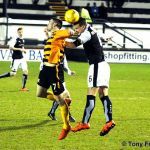 The new manager will be looking for his first points as the Wasps manager, with his two matches to date, involving defeats to St. Mirren and Falkirk. The fixture will be the third time the two teams have faced up to each other this season, and the team from the Indodrill Stadium have yet to score a goal, or take a point. 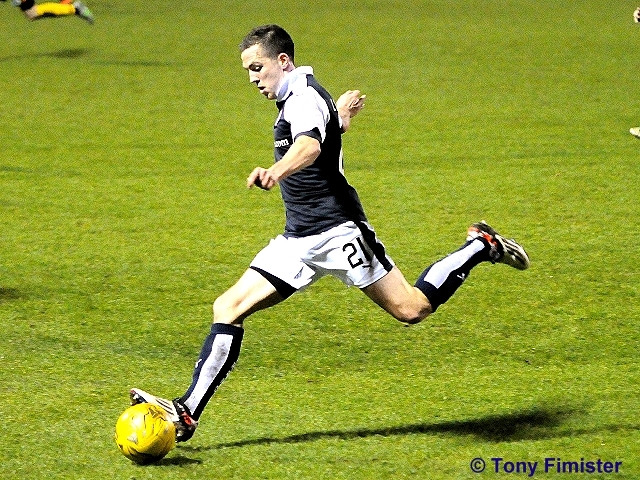 In the first meeting at Stark’s Park back in August, James Craigen got the ball rolling with a wonder strike early in the second-half, and his sizzling volley was followed up by Craig Wighton scoring the only goal of his loan spell, before Mark Stewart completed the scoring with five minutes remaining in a 3-0 win. 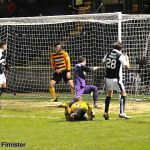 The second meeting was a far tighter affair, as Grant Anderson’s late goal with his first touch after coming on as a substitute was all that separated the teams back in October. 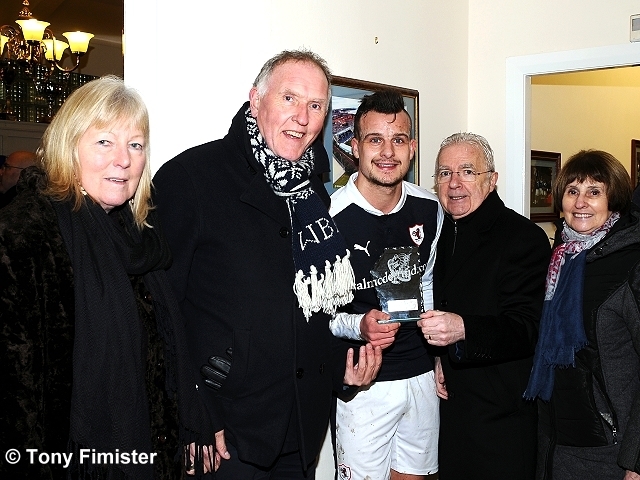 That 1-0 win was Raith’s fifth consecutive league victory, a result which helped move Rovers up to second place in the Championship. 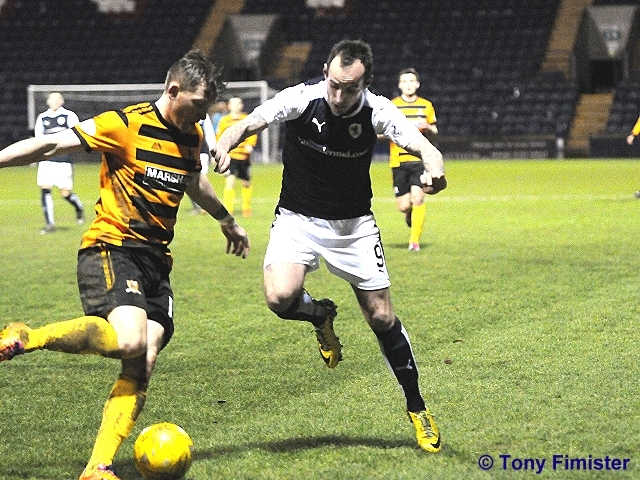 Alloa are without a win at Stark’s Park in 14 visits, with their last victory a 1-0 win back in April 2006. Indeed, the Wasps have only one once in the last ten league meetings, with Rovers winning six and drawing three. Tuesday night’s match referee will be Greg Aitken.